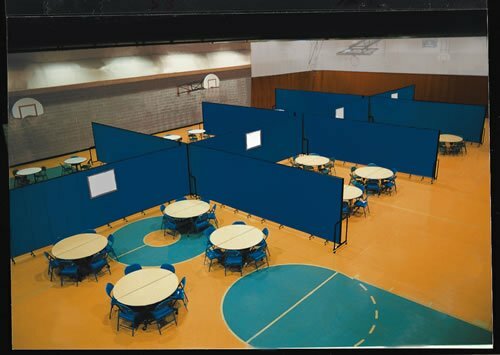 Screenflex Church Room Dividers can easily divide a large room into several rooms. For instance, divide a fellowship hall, worship center or a gymnasium. A staple in churches today! Create any size room for any reason just about anywhere. Create one room or many rooms. Here, a gym has been set up to hold 8 meeting rooms during a religious college conference. By using ten 6′ – 8″ tall x 16′ – 9″ room dividers, distractions are eliminated. The maintenance purchaser for all 300 New Apostolic churches in the United States and Canada prefers Screenflex. So, when they are in need of a portable room divider, they call us. Pastor Bobby, of The New York New Apostolic Church, says that the dividers are perfect for dividing large spaces. Bobby shared that many of his churches use our church room dividers to divide a larger room into two or three Sunday school rooms. Teachers find that the dividers are a great distraction cutter and the kids especially like the ability to pin-up their artwork onto the room divider panels. Room divider panels absorb up to 65% of the sound to keep sound and distractions to a minimum. The sound absorbing properties in a Screenflex panel actually help you hear better by cutting down white noise and echoing amplified by crowds and painted brick or concrete. During church events such as luncheons and special dinners, Screenflex room dividers can roll right into place and open up and set up in seconds. The ease of set up is what makes this portable divider such a pleasure to use. After your event, when you are ready to clean up, Screenflex portable walls collapse down nicely and store in a small footprint 2′.6″ x 3′.0′. Dividers nest together for more compact storing. Fold the dividers up and roll them right into a storage area. Church room dividers are just as easy to fold up as they are to set up. Can Sense of Individuality Improve Self-Esteem for Teens?